After action report by Alan Paull. Though we were a tad short of players, Pete and I decided to push on with the full version of our Pleskau game from 2012, with the 2 of us playing as well as umpiring. So we ended up with roughly 3 v 2 for most of the game; somewhat pressured, but we all coped fairly well. This was our first outing to the Eastern Front for a while, and also the first with the relatively settled beta version of the Mission Command rules. For the Soviets, it looked like an interesting proposition, I think, using battalion-sized groups with hardly any radios, instead of company-sized groups with lots of radios, as in Normandy. For the Germans, a chance to hole up in heavy stone buildings, cover your ears and hope! This account is largely from a German point of view, as that’s what I was playing. Apologies if I am at all unfair to the Soviets! No doubt their propaganda will give a different version of events. The town consists of primarily stone buildings in a rough equilateral triangle about 5km per side with one side running north-south and the triangle pointing towards the east. A river runs through the town, entering at the NW corner and flowing mainly south, forming an effective barrier about a kilometre from the western edge of the town. The only easy routes across the river are a road bridge in the middle of the town and a rail bridge in the south. A tributary with a couple of bridges meanders from east to west, joining the river in the northern poorer part of town. The main road to Riga also cuts the town in two from east to west about a kilometre south of the stream. The railway runs from NE to SW, with a few smaller lines branching at the edges of the town. Most of the town’s buildings are one or two storey stone town houses. The northern area beyond the stream has poorer quality, smaller buildings. There is a large imposing tractor factory in the south part of town beside some railway sidings and close to the rail bridge. Similar very sturdy buildings are on the west bank by the road bridge, but these are not so high. The centre of town also has a few tall municipal buildings that stretch along much of the main road. There are also two tall churches, one facing the road bridge, the other across the stream to the north. Outside town to the east lie some areas of higher ground, one of which is wooded. To the north, east and south the region is mainly open ground and scrub with few buildings. To the NW some buildings continue to run alongside the river. A few buildings continue beyond the western edge of the town proper, and there is some high ground a couple of kilometres to the west. The town itself has many small streets and several quite large open areas, including a tree-lined boulevard that runs NE to SW through the centre. The map’s slightly misleading, in that we shrank the size to about 7 km wide (North to South) and 4.5 km deep (East to the river). This had the effect of enabling the Germans to concentrate a bit more, but for the Soviets to do so too and have less far to travel. The date is sometime during early June 1944. Your battalion has been moved to Pleskau (Pskov in Russian) on the north of the Eastern Front (the “Panther Line”) to help to stem a Russian offensive that may (eventually) threaten Riga. Pleskau is an important rail junction and also, with its position near the southern shores of a series of lakes, prevents the German lines being outflanked from the north. However, the weight of the offensive cannot be stopped by your battalion, and your orders are to conduct a delaying action, by carrying out a ‘delaying defence’. See your sketch map. Your delaying action is a temporary measure, designed to inflict high losses on the enemy and to conserve friendly forces. You have freedom of initiative to act according to local circumstances – for example, limited counter-attacks are permitted, as are feints, deceptions, and so on. Your primary requirement is to conduct a delaying defence for as long as possible (at least a whole day), while enabling extraction of your forces across the river to the west at the end of the action. Timing of withdrawals is a matter for your decision. Night-time withdrawal of men can be achieved via bridges and boats – the latter are pre-positioned for that purpose. Note that this means you should NOT destroy the bridges over the river. You do not have active supporting units on the eastern side of the river. 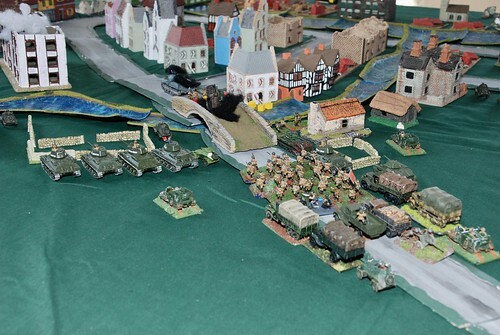 All supporting units of the Division have been withdrawn behind the river. Once your troops have crossed to the western side of the river, they will be secure from further attack except from troops to your immediate front. Your forces consist of a full strength German Parachute Battalion, plus some supports. All your Fallschirmjäger elements are elite. All your other elements are veterans. You have complete confidence in your troops and officers. Your reconnaissance suggests that the opposition has a full Russian Tank Corps. Each of 3 Tank Brigades has about 8 tank models (representing 30 or so actual tanks), plus supporting assault troops. Artillery barrels tend to be extensive, but inflexibly used. You will also realise that, even though it’s called a Tank Corps, that doesn’t mean it’s short of PBI. The enemy has complete air control – you have no air assets, though you do have some flak to knock the enemy aircraft down with. Any of your elements and / or vehicles can be in concealed positions. This means that they will not be spotted till they fire, and even then, only if the enemy is close enough. Each of your company commanders may indicate ONE building or part-building (of size to be occupied by one standard element plus one supporting gun if desired) as a ‘bunker’, which has received specific reinforcement attentions from engineers. Bunkers will have all round fire and will count as strong structures (fortified) against attacks; for example, Soviet field guns with normal indirect fire would need a 20 to cause a casualty to a defending element in firing position. You can win some sort of victory for the German side by hanging on to any areas to the east of the river at the end of the game. The date is sometime during early June 1944. Your Tank Corps is the spearhead of a Russian offensive that intends to open the way to Riga. In front of your forces is Pskov on the north of the Front against the Fascists. Pskov is an important rail junction, and if we take it we may (eventually) threaten Riga. Unfortunately we cannot flank it to the north, because of its position near the southern shores of a series of lakes, while the river that runs through it is unfordable, and the only bridges are in the town. The enemy has occupied the town with elements of a parachute regiment. You’ve cleared forward positions occupied by regular Wehrmacht infantry, but you expect the parachute infantry to be more of a problem. Your mission is to take the town as quickly as possible, so that the momentum of the offensive can be maintained. You are an experienced commander, and Stavka is happy to let you get on with it. Losses are not of any particular concern, though you do appreciate that your more experienced troops are valuable for future operations. Your primary requirement is speed. The faster your success, the more pressure it will put on the Germans and the better the momentum of the follow-up. You have no worries about either flank or rear. There is no possibility of any major German counter-attack, because other units are protecting these spots. Local counter-attacks are a possibility (they always are with the Germans). You have access to more troops if needed, so you’re not going to run out, and you’re quite aware that reinforcements will probably be necessary. Your star will rise quicker, the quicker you can complete the mission. 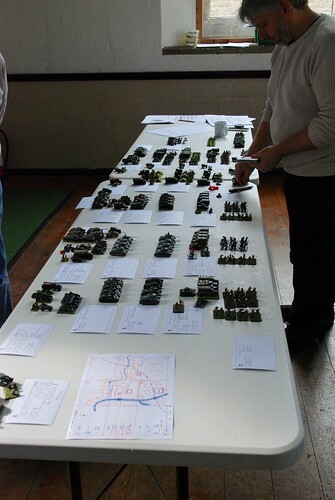 Your forces consist of a full strength Tank Corps (see attached command cards). Each player on your team represents a Brigade Commander. The Motorised Infantry Brigade is the one formation which you have issues with, they are little better than raw conscripts at present having only just replaced the previous brigade which was decimated earlier in the month. This brigade needs to be used carefully. You have the option of further reinforcements if needed. In addition, you have air control – the Luftwaffe hasn’t been seen in the area for weeks. You have been allocated a couple of air raids (dive bombers: 4 models), because Stavka has allocated most air power further south. Before the game starts, you must choose a time and target for these air raids which cannot be altered or stopped. Air reconnaissance shows that the enemy has parachute infantry dug in inside the town and support units beyond the river to the west. Enemy strength is unknown. Ground recce has discovered that elements of the 326th infantry division occupied forward screening positions to the east of the town, and that men of the 2nd Fallschirmjäger Regiment are certainly in the town itself. German Kampfgruppe organisation means that you could be facing a mixed force. You can win some sort of victory for the Russian side by taking and holding as much as possible (preferably all) areas to the east of the river by the end of the game. Prep on the German side was somewhat frenetic, as I was on my own for the planning stage, before I was reinforced by Mike. For planning purposes, and for showing hidden positions and hidden movement, we had A2 colour printouts of the sketch maps. With only very limited man-power, I was forced to stretch the companies quite a bit. I put 5th company all the way from the bridge roughly at 010020 across to the strong points down the road from 012011 to 005014. 6th company was holding the tractor factory (there’s always a tractor factory) and all the way over to 5th company positions, but with some forward LMG outposts on table F. 7th company was behind the other two in reserve and holding the main river crossings. I put a couple of StuGs with 5th company to give the Soviets pause if they came steaming down either main road, but the remaining AT (2 more StuGs and the PaK40) were positioned to cover the main river bridges directly. I didn’t want to lose too much useful AT stuff in the outskirts, because that would just give easy targets for the Soviet heavy guns. I chose to place our precious 8.8cm FlaK off-map, and not in an AT role. The problem with the AT role was that they would have been very difficult to conceal, and unable to use their range advantage, so we would have lost them pretty quickly. No doubt we would have knocked out some tanks, but unfortunately the Soviets can afford tank losses, or else they wouldn’t be attacking a town with a Tank Corps! So the 8.8s were in FlaK role – they were Luftwaffe after all. We had bunkers at 008016 (on the corner of two main roads), 008009 and 003019 (by the joining of the 2 waterways). Knowing the heavy weight of Soviet artillery, we placed most troops in the strongest buildings, in the basements where they were to a large extent protected, and where we had decent ambush positions. Otherwise, we were relying on ambushes from panzerfausts, StuGs and even our rather pathetic recoilless guns. We had anti-tank roadblocks on the main thoroughfares, 1 extensive minefield in an open strip in the middle of town, and also a very well booby-trapped block of houses that we figured they might use as cover against our strong points. The Soviets came in using several prongs. 1 brigade was to try to push across the bridge at 010020 down the road, another (motorised with heavy tank support) frontally due west and a third via the factory, but flanking it to the south. Recce preceded the last prong down the railway line and round the southern side of the large wooded area. Early on, artillery pounded various buildings, but to little effect, as we were either not there (we’d not manned the outskirts) or were in strong buildings. In Mission Command, we cater for light, medium and strong buildings, with 3 height levels, in addition to full blown fortifications. The main structures in Pleskau were strong stone structures (industrial, primarily), so they might lose a top storey, but troops in basements would be relatively hard to get rid of, especially as our troops were all elite paratroops. I had half-expected a couple of hours of massive bombardment from the Soviets prior to their sending in the attacks, but their guns were restricted to brief preliminaries, and some smoke, while their troops advanced to contact. The attack across the bridge at 010020 was rather effectively blunted by Mike’s very smart idea to blow the bridge immediately after their first couple of elements crossed it. The Germans had specific engineer assets for this task, nicely pre-positioned with covering fire from 5th company and StuGs to hit the cut off troops. 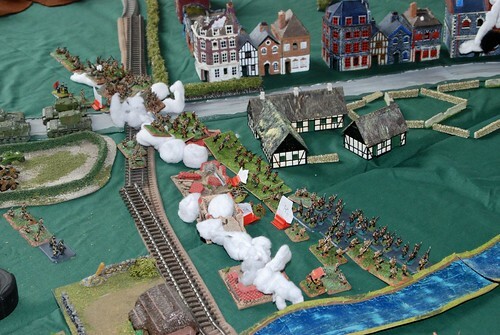 For much of the rest of the game this attacking brigade was getting up engineers to repair the bridge, while pushing on with infantry – this wasn’t the main river, so we settled that the terrain across the now defunct bridge counted as ‘difficult’ for infantry. A heavy weight of artillery fire came down on the built-up areas close to the bridge over the next hour or so, with the result that we did lose most of our 2 models worth of StuGs eventually – in reality, these were likely to have been immobilised or damaged by falling masonry and such like, rather than destroyed outright, but in wargame terms they counted as KOed. Since we had 5th company’s bunker behind this position, but not embroiled, the Germans felt reasonably content with this sector. In the centre, the Soviet motorised brigade smacked into our booby-trapped area and lost very significant casualties; I think they had orders to keep going regardless. When they sorted themselves out and flowed round the danger area, our forward troops were able to keep them back by forcing them to take morale checks that they were very likely to fail because of prior losses. Support for this prong of the Soviets came from their heavy tank battalion (KVs), which was a big problem for the paratroops, as we didn’t have much that could stop them till they got close to the bridges. 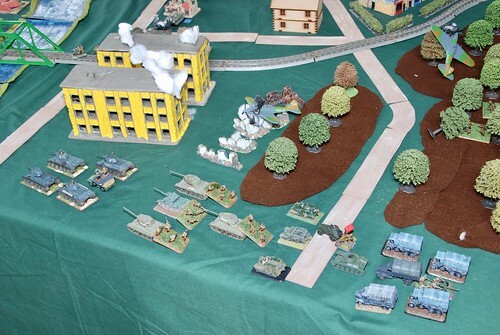 Eventually the Soviets here did get a reasonable foothold in the town, but they weren’t able to move forward on the bridges past the 6th company bunker. To be fair, the motorised brigade was made up of green troops, so this attack was always going to more of a pinning affair than a penetration. It certainly made sure that part of 6th company was pinned. Later in the day, I suspect that the heavy tank brigade would have approached the northern main river bridge. We had a couple of surprises up our sleeves, including some more StuGs concealed at the bridge. Although the ambushing recoilless guns were going to be a surprise, I suspect they were not going to be effective in stopping the KVs, so we would have been very reliant on the StuGs. The southern prong attack towards and round the tractor factory was more successful for the Soviets. A couple of Soviet air strikes on the factory turned out well for the Germans – the FlaK shot down several aircraft (2 models) and the bombs themselves were mostly ineffective. That’s one of the few times we’ve had successful FlaK defence. Lesson: don’t always use 8.8cm FlaK for anti-tank – they’re pretty good FlaK guns! That aside, the German forces in the factory were woefully inadequate to defend such a large area. We repelled the initial couple of attacks, but supporting fire from tanks, bren carriers and lots of infantry caused casualties on the defenders, and in the end we had almost nothing left, the remaining paratroops surrendering to the final assault. A mortar team held out in the middle of the factory for a while, but I figure that it too would have surrendered on the approach of the attacking battalions. As the Soviet tanks came round the factory to head for the bridge, our StuG position held them up. Owing to the range, the Soviets couldn’t discover exactly where the firing was coming from, so they had to lose a small number of vehicles to find out which built-up area concealed the StuGs. Their recce troops were very useful here, and of course their tank numbers told. 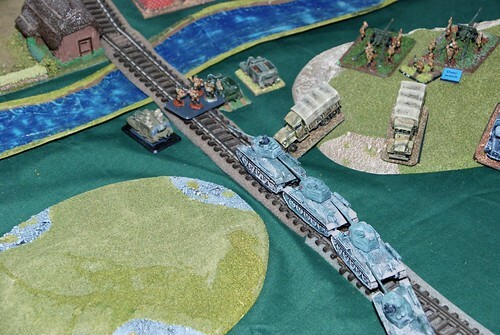 Shortly after this a tank battalion and supporting truck-borne infantry dashed for, and across, the bridge! We had insufficient blocks on the edge of the table (I plead shortage of time!) to outright prevent this. However, covering fire from the concealed PaK40 knocked out almost all the Soviet tanks, and their motorised infantry also lost their lead vehicles. 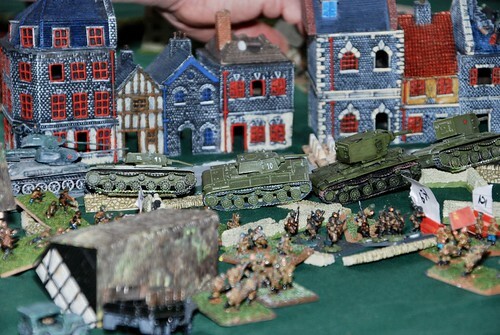 By the end of the session the Soviet infantry were only precariously holding a couple of buildings on the western bank. Mind you, achieving this forward position was quite an accomplishment (though technically not a Soviet objective! ), so credit to those guys. Almost the whole of our 7th company was defending this area, so my suspicion is that the Soviets would have been pushed back. The final German success of the day was to knock out some Soviet mortars using the 8.8cm guns in counter-battery role. So, even though the Soviets did manage to reach the river, it was, I feel, a well-contested affair by both sides. We’ve kept a note of the outcome of this engagement, so that we can continue with a post-Pleskau Soviet breakthrough later in the year. I think the Germans did quite a bit better this time around than in our 2012 version of the game, though we had a different setup and much better developed rules in 2017, so perhaps not entirely comparable. The Germans didn’t suffer huge casualties this time, but there was an inevitable attrition owing to Soviet artillery fire. This felt about right (to me at least). The Soviets suffered rather more casualties, as expected, in all areas, but then again, they had the material advantage, and were in a position to spend it for ground gained. I would have preferred longer to plan and more players to help. For defensive positions, I think we’ll need to supply some parts of the plan in advance, so that the defenders aren’t overly taxed, particularly as we usually have fewer players on the defensive team than the attacking one. Players should be encouraged not to hurry. I think the Soviets could have carried out a more concentrated fire plan for a longer period, and could have attacked more slowly, more methodically and with less risk – but still this would have been quite fast, but not break-neck speed. Re-organisation of attacking troops takes time, and you can, in fact, realistically take that time. Positioning of specialist assets, such as engineers, needs a lot of thought, especially if there might be bridges to repair or mines / booby-traps to remove. I got the impression that the Soviet Tank Corps was a different kettle of fish to our more usual Normandy forces. However, I’d like to invite comments from our Soviet players on that. Certainly the motorised brigade looked very different, with lots of elements but a need to keep them close together, so vulnerable. For the future, A2 printouts of the actual table layouts would be far superior to our sketch maps, and would have speeded up our interpretation of where everything was, but this requires access to a printer on the day. Not impossible, but would need organising. It’s important to keep track of where hidden elements are located, so a closer approximation to the real layout would be advised. Bearing in mind the relatively small number of players that we had, I think it went well, and there were no particular difficulties with the game mechanics. Previous Previous post: April Big Game: Mission Command heads north!